As part of the “Program 200,” twenty-two parish complexes are to be built in the north of Moscow. These plans were voiced at the offsite meeting of the northern administrative district’s prefecture of the Russian capital that was held on June 1 by the curator of “Program 200” of the government of Moscow, Vladimir Resin. Addressing those gathered at the meeting, V. Resin noted that there were not only representatives of the executive authority and the Church there but also representatives of municipal assemblies. According to him, the opinion of local residents must always be taken into account during the building: “There must be one approach: residents are always right! Of course, if they are majority–a real majority and not just several noisy people who are disturbing the public,” reports the press service of the Church Construction Support Fund in Moscow. There have been cases in some Moscow districts where concerned persons spread leaflets with misrepresented facts and unjust accusations of cutting-down greenery and other violations that supposedly happen during construction. It should be reminded that the territories of parish complexes will be open for everyone for 24 hours a day and the planting will be carried out in harmony h the city landscape. The mayor has entrusted the prefectures with this process so that the beautification should be of maximum convenience for Muscovites. The first deputy prefect of the northern administrative district of Moscow Vitaly Nikitin has voiced disturbing numbers in his report. From 1 million 100 thousand residents of the district only 8 thousand people can get to all the district’s active churches, which makes less than 1% of the population. V. Nikitin sees here a great field of activity and the prefecture will take this information into account in its further work. “One Church, on Novopodmoskovny Lane, is now in an active stage of construction. The community is already living its own, full life,” said the first deputy prefect. Sophia Kovalevskaya Street, 14 (Church of St Matrona of Moscow). 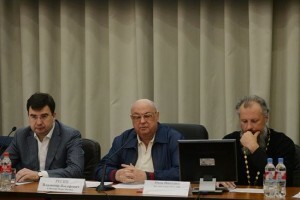 After the meeting, communicating with the journalists, Vladimir Resin appreciated the potential of the district’s leadership. “There have been certain difficulties here but now I see the construction is progressing greatly,” he said. Hieromonk Nicodemus (Kolesnikov), the First Deputy Chairman of the Financial and economic management of the Russian Orthodox Church, told the journalists interesting details of the life of a parish on the outskirts of Moscow–the first Church of Holy Tsar Nicolas II and his family is under direct care of the house of Romanov.